Well, I got back from my 3-week Easter Break vacation on Monday, and it’s taken a few days of down time to really get back into the swing of things. Let me tell you… 24 days of constant walking, sleeping in hostels, re-packing every 3 days, not-so-healthy restaurant food, and a new climate every 3 days really tires you out! But, it was the most amazing experience EVER! 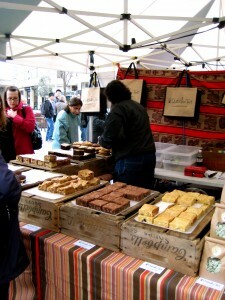 We found this Chocolate Festival on the South Bank of London on our first day of exploring. What a wonderful way to start our travels! It was fun to pick out brownies, cupcakes, churros (with chocolate dipping sauce), fudge, and more against the backdrop of London (you could easily see the London Eye from the festival). This is the Tower Bridge in London (…and that’s me standing on the boardwalk!). It was definitely tied with the Millennium Bridge for my favorite bridge in London, but it makes a MUCH more impressive photo. I loved how bright the blue color on the bridge was. It was crazy that, walking along the South Bank you could see this, the London Bridge (which is actually quite ugly), Shakespeare’s Globe, St Paul’s Cathedral, Tate Modern, Big Ben/Parliament/Westminster, and more! We flew to Rome on March 30th, and spent a week there. Because our only two flights (London to Rome, and Rome to Prague) were well before the volcanic eruption in Iceland, our travel plans were not affected by the ash. The trains that we rode after the eruption, though, were packed! Our hostel in Rome was about 5 minutes from the Colosseum, so we walked past it every day. My favorite part of Rome was probably all of the history. For example, the Colosseum was built around 70 AD (or CE, depending on which convention you use), and this is considered relatively ‘new’ for Roman architecture. Amazing, huh? This is the Trevi Fountain. 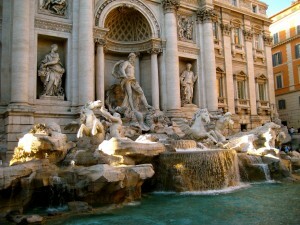 Legend has it that, if you toss a coin into the fountain, you will return to Rome. Of course, I threw a few of my Euro cents in! 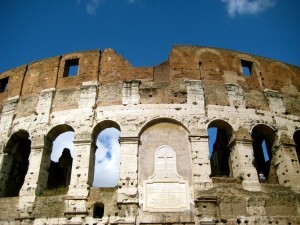 The Romans loved to build fountains to showcase their ability to bring water into the city via aqueducts. I was in Rome during Holy Week, which meant that the crowds were VERY large… but it also meant that I was able to attend Easter Mass at the Vatican (in St Peter’s Square). 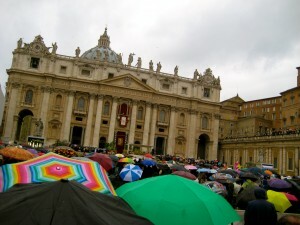 It was, unfortunately, raining the entire time, but I kept reminding myself that this was an incredible once-in-a-lifetime experience, and the Mass itself was great. 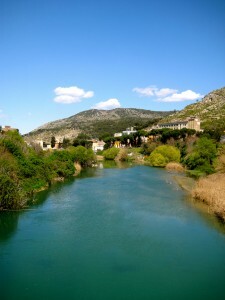 We took a couple of day trips outside of Rome, too. 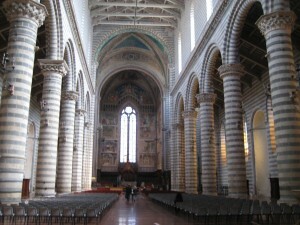 The first was to Orvieto, which is a beautiful hilltop village. The scenery is amazing, and this Duomo (cathedral) was one of the coolest churches I saw during my whole trip. I loved the striped stone effect, and every detail was so very intricate. 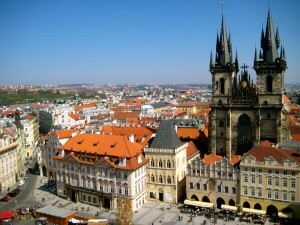 A week later, on April 6th, we flew to Prague on a cheap airline, Wizz Air. The experience was actually great, though, since we got randomly placed in the Emergency Exit row! This is the view that we got after climbing up a clock tower just off of Old Town Square in Prague. It was probably my favorite city of the whole trip, and I hope that you can see why in this picture. It was charming, beautiful, old, and the weather was fantastic!! Sorry if this weirds anyone out… but we took a quick trip from Prague (on the train) to Kutna Hora. It is home to an ossuary, which is a cemetery where the bones of the people buried there are used to decorate the church. In this case, all of the bones belonged to monks. 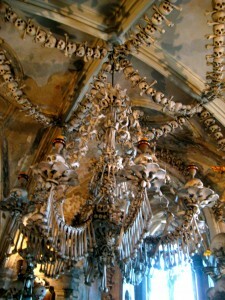 This chandelier actually includes every bone of the human body! The blogging software is being picky about uploading photos right now, so I will continue with Vienna, Munich and Paris a little bit later today. Until then, I hope you enjoy the pictures I have shared so far. 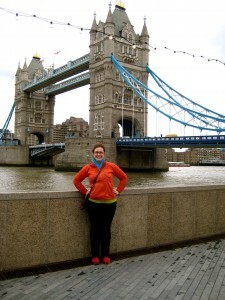 This entry was posted in Alayna Schoblaske '10, Scotland and tagged London, Prague, Rome, travel. Bookmark the permalink.